LEXINGTON — It’s a cold Sunday morning with a snowstorm threatening. Most people are nestled in bed or drowsily leafing through the newspaper when Charlie Bent steps up to the espresso bar at Ride Studio Café. The 44-year-old website developer from Cambridge just completed a 21-mile bike ride through Lexington, Lincoln, and Concord. “I wouldn’t be riding this time of year if it wasn’t for this place,’’ he said. The promise of camaraderie and coffee nudged him out the door at 7:30 a.m. for the group ride organized by the eight-month-old shop in Lexington Center. Cycles on one side and an espresso bar on the other, Ride Studio Café is a new business model that is winning over fans on two wheels. “Within Boston there are a lot of bike clubs, but not a lot of places where you can go if you need water, a good cup of coffee, and a smile,’’ said Jeremy Blackowicz, a 34-year-old lawyer from Somerville. Bent and Blackowicz are among a half-dozen men and women in Lycra who are charged up after their spin through a rustic swath of the Boston suburbs. They stash their bikes on the in-store rack and swap war stories while downing macchiatos and tearing into cheese scones. It feels like the upbeat vibe at an après ski bar. “It’s a great place. There is always a common element and one Kevin Bacon in every crowd,’’ said Matt Roy, an Arlington cyclist drinking a soy latte. In other words, everyone in the Boston cycling community knows one another within six degrees of separation. At the helm of this hybrid establishment is Rob Vandermark, who also owns Seven Cycles in Watertown. He designs, builds, sells, and services high-end bikes for commuters and racers. Ride Studio, which opened in May, serves as a Seven showroom, sharing space with brands like Public, a city bike that comes in splashy hues, and Olympic-ready rides from Cervelo. They fetch between $400 to $12,000 here. Top-tier threads from sportswear designers Rapha and Campagnolo line the back wall. Opening on Massachusetts Avenue across from Peet’s and Starbucks, selling coffee may seem like a gutsy move, but it is no afterthought here. The experienced resident barista, Sal Persico, has slung lattes at the Espresso Royale Caffé and Pavement Coffeehouse in Boston, and Crema Café in Cambridge. Persico and café manager David Simon tested more than 25 bean suppliers before settling on De La Paz from San Francisco for their pour-over coffee, and Stumptown Coffee Roasters’ hair bender blend from Oregon for espresso drinks. They use the time-intensive pour-over method, which custom brews each cup. Such attention to detail is not lost on cyclists looking for pre- and post-ride fuel. 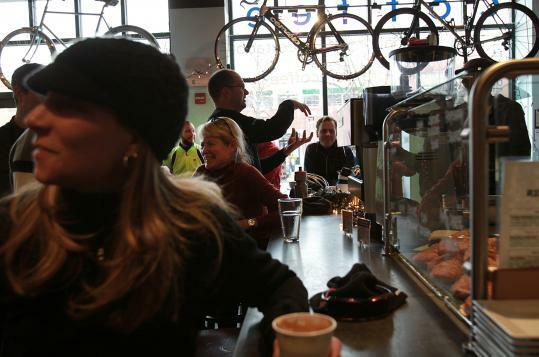 “Five or six years ago it was hard to find good coffee in Boston,’’ said John Bayley, a Watertown resident who rode to the café on a tandem bike with his wife, Pamela Blalock. The connection between coffee and cycling is starting to percolate across the country, with bike-friendly cities such as Portland, Ore., and Minneapolis taking the lead. A Portland company that makes bike parts, Chris King Precision Components, also offers its own line of coffee. It recently started selling an espresso tamper, a key barista tool, fashioned out of a bike hub. “When our customers saw this, they just went nuts,’’ said Vandermark, who uses it to pull shots. Two years ago, bicycling icon Lance Armstrong opened Mellow Johnny’s Bike Shop in Austin with a coffee bar inside. Vandermark, who grew up in Natick, chose Lexington because of its proximity to the Minuteman Bikeway and because it’s the gateway to great riding routes on this side of Boston. To urban pedalers, it’s more than a store. “When you go for a ride on your bike alone and you come in here and someone says, ‘How was your ride?’, it’s so welcoming and inviting,’’ said Bent. Being able to come as you are is important for those who are often decked out in tight-fitting gear and shoes with metal cleats. Previously they had to make do with mainstream cafes. “You come in wearing Spandex in the summer, you’re sweating and clickety clacking and people give you the stink-eye,’’ said Roy. On this particular morning, only a few people are in street clothes at Ride. Towels are passed along the bar to help red-faced riders dry off. “Cyclists don’t want to be a pain, we just have a lot of equipment that can be a pain,’’ said Dave Nanian, a 49-year-old software developer from Weston. Vandermark admits Ride Studio Café can be confusing to the general public. “People may think it’s a bike shop with a bad coffee bar,’’ he said. Aficionados say the coffee is as strong as the bike selection. “I had the first cappuccino they ever made,’’ said Sean Griffing, a Boston resident who is the general manager at Rialto restaurant in Cambridge.